Modern civilisation has its problems but right now it works. Electrical grids, water systems, mass agriculture, global shipping, the internet, road networks, governments and financial markets are all still functional, and life for the majority is significantly easier and more colourful than for most of history. In the presence of civilisation, most of our basic needs (food, water, shelter, culture) are fulfillable, even if civilisation is highly fragile. Nonetheless, many people are angry. Angry with the system, angry with authority, angry with society. We see it in #OccupyWallStreet. We saw it in the spontaneous thievery and riots in England in August. We saw it in the ongoing Arab Spring. We see it in Greece‘s protests against IMF-imposed austerity. We saw it in the Tea Party’s shades of “mad as hell and I just can’t take it anymore“. People are mostly angry about some combination of poverty, angry about inequality, angry about rising joblessness, lost civil liberties, the loss of Western manufacturing, economic weakness, bailouts, or simply perceived unfairness. This isn’t a partisan issue; it exists as much in so-called left wing (like anti-austerity protests) and right-wing (Tea Party) camps. The essential problem (that affects everyone who is not part of the elite) is that while civilisation functionals reasonably well for a vast majority, it functions significantly better for a tiny minority. If nurses, teachers, soldiers, electricians, tradesmen, scientists (etc) are getting $50,000 a year for their labour, and traders on Wall Street who were bailed out after their businesses failed are getting $5 million bonuses, eventually the majority will start to seethe with questions like “why are they more valuable to society than we are?“, “if they failed to see the last recession coming, why are they still getting rewarded?”, “if unemployment is so high the economic system cannot be working, can it?, and so forth. Corporations — and by extension, governments — have much reason to be fearful. Recent protests—Occupy Wall Street, of course, but also the Tea Party movement as it first began—rise out of a profound rage over unfairness in this country. The scale of this unfairness and inequity makes it hard to know where to direct that rage, to know what to do. 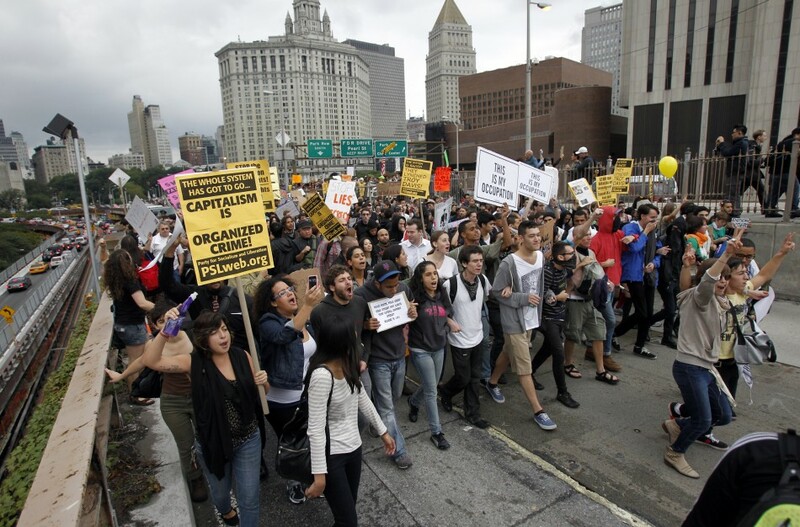 Occupy Wall Street has the right target; but where their rage will go, nobody today knows. I am certain, though, that any alert board should be instructing their managers to do three things: admit the problem exists, take positive steps to make the corporation function fairly, and consider what other steps would address the concerns of the protests. Simple? Not quite. But necessary? You bet. If the present Occupy Wall Street protests do not create an unignorable threat, they certainly raise the prospect of one in the near future. Rage at unfairness is not easily quenched and once started can be hard to curtail. We’ve seen this time and again throughout history. Shareholders may think of themselves as victims of CEO power, as innocent shareholders , but we need only look to the Russian and French Revolutions to see that everyone having anything to do with fallen power, or in this case “guilty corporations”, may be attacked and injured—even if, like shareholders, their only crime is doing nothing. But the real danger of all of this is not to corporations, or governments, or Wall Street, or the power elite. The danger is to society itself. Corporate and financial hygiene is at an all-time low, and the global financial infrastructure is an interconnected hyper-leveraged house-of-cards ready to come crashing down. The higher joblessness and wage inequality go, the sooner the smouldering embers of fury we see today will be transformed into a burning conflagration of rage in wider society. If people with electricity, water, food and Chinese consumer goods are getting furious today, while civilisational is still functioning reasonably well, imagine what might happen if another financial crash caused by a Euro-default raised unemployment another 5%? If gasoline costs rose another 50% in response to an oil shock? If a new conflict or war significantly raised the cost of imported goods? Establishments need to quell the furies of the population before they reach tipping points by letting bad banks and businesses fail, by reforming the tax code so that everyone pays a fair share, by creating jobs, and by finding ways to reduce citizens’ and institutions’ debt burden. Unfortunately, I believe that the global financial and political systems are so entrenched that at this stage deconstruction (rip it up and start again) is impossible because vested interests make any such changes highly unlikely. The real danger is that in desperate times people will follow any charlatan who can offer food and security. In the 20th Century, Germans, Italians, Russians, the Spanish, the Chinese, the Vietnamese, the Libyans and others all discovered the dangers of overthrowing corrupt entrenched establishments, and replacing them with new regimes with no respect for individual liberties, religious freedoms, the freedom of speech, the freedom of association. I want the revolutionaries of the 21st Century to understand that the problem is not capitalism, nor liberal democracy. The problem is that a tiny minority are rigging the system to enrich themselves. This entry was posted in Current Affairs and tagged bernanke, black swans, charlatanism, china, communism, financialism, goldman sachs, nationalism, nazism, obama, parable of the broken window, Ron Paul, socialism, tea party, warren buffett, white supremacism. Bookmark the permalink. Dead on in so many respects. We don’t need to end capitalism… we need more of it. The good and the bad. Failure must be allowed to happen. Reasonable regulation must be recognized as a fundamental necessity for the free market to function. 2) Break up the TBTF banks. Sounds good to me. Here in the UK our government is trying to instate a version of Glass-Steagall. The problem is the date for compliance is in 2019. There will be another crash and round of bailouts, and unemployment spike before that. Occupy Wall Street protests are coming to Melbourne this weekend. I will keep you posted on the response. Australia has such a high standard of living, and little respect for Economics (Sport is our religion) that I think it will be a flop. We are an apathetic mob in Australia. Sad but true. But I agree. Glass Steagall and allowing TBTF banks to fail is a start. That way small banks with Managers at the coal face making lending decisions. The problem therefore IS capitalism and liberal democracy because they allowed the tiny minority to rule from the shadows. Indeed it could be asserted that the problems are caused by central banks, fractional reserve lending etc. and not Wall Street per se, but the central bankers propaganda want to divert attention away from them and they want to make it appear as if a little regulation and transparency will solve the problem. The people of the world allowed a tiny minority to rule from the shadows. I’ve never heard anyone advocate abolishing capitalism and liberal democracy without advocating either anarchism (rule of the jungle) or autocracy (another kind of rule of the jungle), both of which would imperil all the good things about the world today (abundant water and electricity, mass agriculture, freedom of speech, etc). I love the arguments against free markets, as though they actually exist. They will be distorted by anyone with enough power to get away with it. Our government in Australia distorts markets, then blame capitalists for the inevitable bad outcomes, as though any person or group has any power comparable to them. We have benefited from electricity, hot water plumbing, free speech and abundant cheap food (though most of it is nutritionally bad). However free speech and political freedom in general are being eroded by the modern democratic state, I think many of us feel we are sliding into state tyranny. We are living through ‘interesting’ times, it can be scary and painful with the possible break down of law and order. The Internet can help create new organized groups of associations and can help. There is something definitely wrong when millions of low income people keep billionaires and their system in power. The situation cannot be allowed to continue without heads rolling so to speak. Islamic finance (or something similar to it) is an option if we want to move beyond the credit-based economy but it is still compatible with capitalism and democracy. Nassim Taleb was recently asked a question about this and his response was along the lines that while Islamic finance is probably better than the present system in principle, there are many tricks to arbitrage around the rules of Islamic finance. Personally I feel that the best possible transformation would be steps to remove the agency problem from the financial system and introduce more responsibility. The first step is abolishing limited liability. Looks nice. Here we’ve got no real investment banks, but the government is trying to transform retail banks into monstrous retail-plus-investment banks (with constantly failing attemps over the last decade). Governments should learn to learn from the history. The ceding power to the financial elite was a Faustian bargain. No one would be complaining if they had continued to generate the low risk double digit market returns in our 401ks that Jeremy Siegel and his ilk promised. Very true — nobody would have complained about Madoff if he had kept generating his “returns”, either. The problem is not capitalism. It’s the separation of risk from reward, personified by the commonness of “other people’s money”. That is why people call for smaller government. That is why people are up in arms over wall St. That is why banks are so unpopular. That is why people complain about executive salaries. No one looks after your money better than you do!!! Yes limited liability and giving personhood in law to corporations are a problem.